Sony launches its TV scrappage scheme | What Hi-Fi? Buyers of new Bravia screens of 26in or larger can get a trade-in for their old TV, with a maximum £150 off models of 46in or more. The scheme, available at participating stockists, allows buyers to trade in any TV, working or not. Matt Coombe, Sony UK's General Marketing Manager, says that “The campaign offers customers the advantages of swapping old for new rather than simply throwing away – encouraging old televisions to be responsibly disposed of. "Another important element of this campaign is the reassurance for our customers that Sony will help them through the digital switchover; we understand that peace of mind is currently high on priority lists at this difficult economic time." The TV ad features Cooper harking back to the old days – the 80s(!) 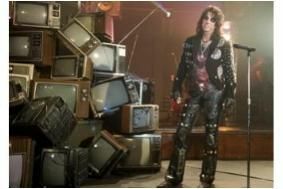 – when throwing TVs out of hotel windows was apparently the done thing for rock stars. A website detailing the scheme goes live this Friday.